Herts Baseball Club issued the following guidance for its members and fans ahead of Monday’s advance ticket sales. Thank you to all who took part in our recent survey to help enhance the MLB London Series experience for Herts fans. Most of you would have seen the ticket prices announced yesterday (see map above) and many would have been disappointed that the more affordable tickets cover such a small proportion of the stadium. But do not despair. Thanks to your feedback, we think we have identified reasonably affordable ways to enjoy this historic occasion which is expected to be a game-changer for baseball in this country. Many Herts fans appear to be happy to pay up to £60. 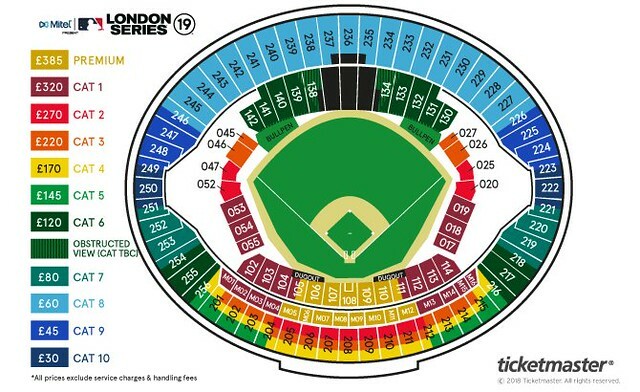 Category 8 tickets are priced at £60 and are relatively good outfield seats given the proximity of centerfield compared to left field and right field blocks. Therefore those seats are likely to be closer to the action than Category 7, 9 and 10. Category 9 and 10 are further away from the field, but are at a lower price of £45 and £30, respectively. There are Herts fans who would like to be closer to the action and are happy to pay the higher prices. If you plan to attend only one of the games, more Herts fans will be going to the Saturday game, so aim for that game if you want to increase the chance of sitting near a Herts fan. Another reason to aim for Saturday is that we are considering organising the screening of the Sunday game on a big screen with food, drinks and other activities. MLB may also organise a similar “Fan Park” event with a big screen so there may be an affordable option for the British baseball community to enjoy the occasion together. MLB will soon be sending an email to registered fans with their personal code which they will need when purchasing tickets on ticketmaster. Old Ticketmaster.com accounts cannot be used. If you have not done so already, you can set up a new account at www.ticketmaster.co.uk/member now, which will save you time at checkout. If you plan to buy more than 8 tickets you will need two different codes and two different credit/debit cards as there is a limit of 8 tickets per code and per card. In such circumstances it is advisable that the cardholders are different. We don’t know how many tickets will be released for pre-sale buyers at 10am on Monday, 3 December, and whether the system will withstand the demand. It would help if Herts fans could share their ticket-purchasing experience by tweeting @hertsbaseball or on the Herts Facebook page. We will then share any helpful advice to Herts fans via Twitter and Facebook. If you missed today’s deadline to register or advance tickets sell out before you manage to get yours, we have been informed of an opportunity for members of BBF clubs to register to buy tickets on 5 December before they go on general sale on 6 December. Herts members should check their emails for a message from the club containing a registration link. Next Topic: Another view: the best seats in the house?